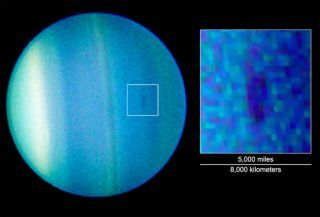 Images of Uranus reveal for the first time a dark spot inthe planet's northern hemisphere. During the past decade, many bright spots have been seen on Uranus,in both red and near-infrared filters. But this is the first dark spot everseen on the planet. A team led by Lawrence Sromovsky of the University ofWisconsin and including Kathy Rages of the SETIInstitute, Heidi Hammel of the Space Science Institute (Boulder, CO), andPatrick Fry of U. Wisconsin, observed the dark spot on Aug. 23 using the HubbleSpace Telescope (HST). Other images taken a day later also show the dark spot nearUranus' limb, a sure sign that the spot had a lifetime of at least severaldays. In fact, we can be sure the spot had a lifetime of at least two months. Ateam led by Mark Showalter of the SETI Institute also has been observing Uranuswith Hubble in an effort to understand the planet's ringsand satellites. Some of their images taken on June 16 show the dark spot,two months prior to its discovery. The recent observations also showed a bright spot just to thenorth of the dark spot, which may have some people scratching their heads andasking "Why do I think I've seen that before?" They probably remember theVoyager images of Neptune'sGreat Dark Spot and its associated Bright Companion. It would be veryexciting to see similar features forming on Uranus as spring comes to thenorthern hemisphere after decades of winter darkness. Uranus' bright spot,however, is located at 30?N latitude, an area where brightspots have been seen on many previous occasions. In enlarged images of thisregion the bright spot doesn't appear to be connected to the dark one, and is probablyjust a case of two spots passing by each other. There is a reason for the recent spate of activity onUranus. Since the planet is "tipped on its side," the seasons are more drasticon Uranus compared with those on Earth." In contrast to Earth, with an axialtilt of 23?, Uranus is tilted 98?. To put it another way: On June 21 on Earth, the Sun isdirectly overhead in Mazatlan, Mexico. If Earth had Uranus' axial tilt, on June21 the Sun would be directly overhead along the northern coast of EllesmereIsland, in the Canadian Arctic. At the conclusion of Voyager's planetary encounters, Uranusheld the undisputed title of "blandest planet in the outer Solar System." Inpart this was due to the timing of the Voyager encounter. Uranus reached southernsolstice in October 1985, and Voyager flew past only three months later--a Uranian"date" about the equivalent of Dec. 23 on Earth. With the Sun almost directlyover the Uranian south pole, only mid-to-high southern latitudes were clearlyvisible. This region on Uranus is covered by a substantial, and nearlyfeatureless, cloud of methane ice crystals, giving the planet the appearance ofa cue ball in the Voyager images. However, latitudes north of around 45?S are much clearer. Now, Uranus is approaching equinox. Almost a full season haspassed since the Voyager2 encounter. On Uranus it is now late winter in the northern hemisphere, orMar. 16 on Earthly calendars, with equinox due to occur in December 2007. Theclear northern regions of Uranus' atmosphere are easily visible from Earth. Andas the Sun has risen over Uranus' northern hemisphere for the first time indecades, it has revealed much more activity than Voyager ever saw. Previously, most of this activity has taken the form of smallbright spots, which may be akin to thunderheads rising high into theatmosphere. The newly discovered dark spot, on the other hand, may be caused bya thinning of the underlying methane "stratus" layer. During the next few years, as Uranus passes through equinox,Hubble and ground-based telescopes around the globe will turn their lensestoward the planet. We will find out if the dark spot has a life span of yearsor just months and whether other dark spots will develop. We expect to witnessthe development of a bright cloud over Uranus' north pole similar to the onethat has been in place over the south pole for the past 20 years. These areinteresting times, indeed, for Uranus watchers.